The range of teas in the Ujicha family offers something for everyone, at any time of day. Sencha and Gyokuro complement all varieties of food and are ideal ways to finish a meal, but why not also drink Maccha from time to time? The luxuriously bitter-sweet taste of Maccha will certainly be a welcome change, and you need not let tea etiquette stand in the way. The best personal etiquette for Maccha is to simply enjoy it when and how you like. Granted, there are some basic rules for making a good cup of Maccha, but once you know these guidelines, you’ll be free to customize this fine tea to your liking. From a nutritional point of view, Maccha is also rich in vitamins and minerals so it offers you several health benefits as well. We hope you will take this opportunity to get to know Maccha a little bit better. ●To prepare Maccha, it is best to have a teabowl or something similar, and a tea whisk and tea scoop are useful as well. 1. Pour some hot water into the cup to warm it up. 2. 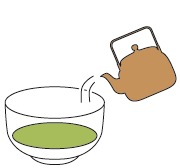 Pour out the water and put two teaspoonfuls of Maccha into the cup. 3. Gently pour 80cc of water cooled to 80°C. 4. 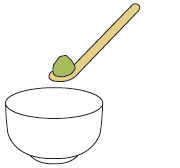 Use the whisk to dissolve the Maccha powder until smooth, moving it quickly to and fro. 5. When there is a fine foam covering the surface, stop mixing and draw the whisk out, moving it a counter-clockwise spiral motion. When you don’t have all the tools for proper Maccha, why not use a cocktail shaker to make fun and easy Maccha-based drinks? 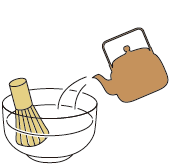 Use cold or warm water and Maccha power, then just shake away! 1. Put about 1 teaspoon (about 1.8 grams) of Maccha into a cocktail shaker. 2. Add 180cc of cold water. 4. Serve over ice and enjoy. 2. Add 15cc of cold water. 4. Add about 100~180cc of milk and shake again. * Make sure to dissolve the Maccha in water first before adding milk. * Feel free to add some sugar to Maccha drinks to delight the kids. 4. Pour contents into a teacup and add hot water to taste. 4. Pour contents over your favorite ice cream. 1. Place one ice cube in the shaker. 2. Add about 1 teaspoon (about 1.8 grams) of Maccha. 3. Add 50cc of cold water. 5. Pour into a cup and enjoy. ・Do not add hot water to the shaker as pressure from the steam could be dangerous. ・Never use carbonated water in a shaker as the whole thing could explode. 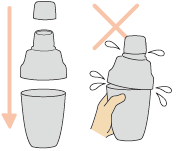 ・Before you use the shaker, always make sure the top, strainer and body are all securely fastened together. A loosely assembled shaker often makes for a fine mess! Hold the bottom of the shaker with the middle finger and ring finger of your left hand while securing the strainer with your thumb. Use your index finger and pinky to secure the body, top to bottom. Make sure the palm of your hand is not touching the shaker. 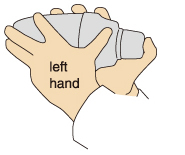 Use the thumb of your right hand to secure the shaker top. 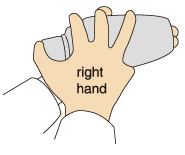 Use your right hand to support the body as shown. If you have ice inside the shaker, use the strainer-top to pour your drink.